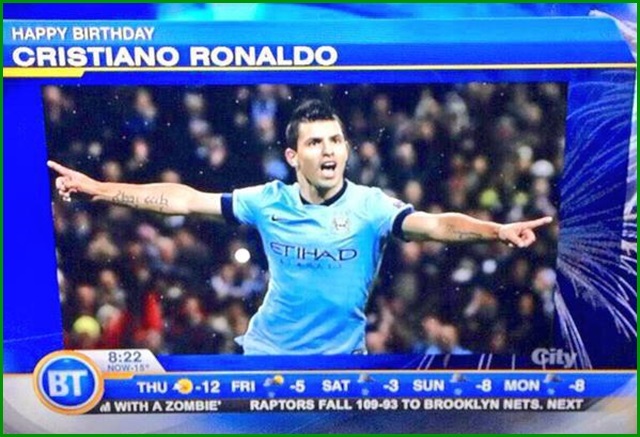 Quite what it had to do with them is open to debate, but Canadian morning news programme Breakfast Television went out of their way to wish Cristiano Ronaldo many happy returns on his 30th birthday yesterday. It looks like somebody’s lagging behind on their Cristiano Ronaldo sociology course this semester. And what’s all this about zombies anyway? Well, to be fair, Agüero is from Argentina, where they speak Spanish, just like in Spain, which borders Portugal. Also he used to play for Atletico Madrid, which is basically the same as Real Madrid apart from all the money and European Cups. Also, his birthday is on June 2nd, which if you write the American way (which Canada is next to) is 6/2, which is close to 5/2 meaning February 5th. So it was really a pretty unavoidable mistake. Ha Ha! Go Canada. Rest assured that if it was an Ice Hockey player we’d have gotten it right! Ah Canada, the biggest played sport is Soccer yet the old farts in the media keep trying to play down the sport and put a half heart effort in anything to do with the game.